Tij Priddle wasn’t the same as every kid. Bathing himself in Beach Boy anthems every Sunday from dawn until dusk, Tij was bound to end up as a musical star. And now, the 23-year-old is the face behind Melbourne band Boy in a Box. 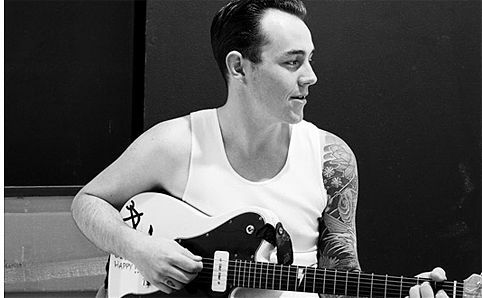 Ever since highschool Tij has been involved in numerous bands and bedroom projects, but the brylcreem musician says that his new musical career in Melbourne was all an accident. ‘I actually moved down here last year to get away from music. I’m so in love with Melbourne and wanted to do something different for a while,’ he says. After his Dad passed away though, Tij found out about the 2010 Blue September campaign and it came instinctively to pay tribute to his father – and it all started from there. Touring nationally with British India over the next few weeks, Boy in a Box is giving audiences his classic hooks and chunky riffs with a powerpop and punk feel. If you’re lucky, you may also get a taste of one of his famous nudie runs, that he says happen all too often. ‘I have countless memories of doing nudie runs with the drummer from Slow Down Honey. Every new town we go to, it rolls around to 2am and somehow we’re running naked down the street,’ Tij said. Tij remains splattered over the Triple J airwaves and he admits writing songs comes naturally and is almost unthinkably easy. His debut single Glitter, Gold, Ruin was created within an hour at a Sydney studio. Wanting to remain an individual, he doesn’t like comparing himself to others and is ‘letting his music run it’s natural course’, and trying to create unique music that’s close to his heart. This entry was posted in Music and tagged boy in a box, british india, music, triple j. Bookmark the permalink.